’83 Vanagon diesel dipstick mod. This might be of interest to anyone wanting to use an 82 block with a later Model vanagon, or for anyone wanting to get away from the stick-in-the filler tube setup. 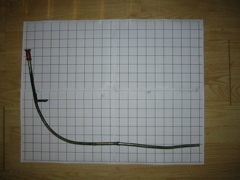 A few weeks back I wrote that I had carefully studied and measured the dipstick tube on my vanagon-specific NA diesel and was trying to make another one out of brake line for the 82 vanagon-specific block I was building. What makes the blocks specific to the years is the treatment of the “dipstick” hole in the side of the block. With the 82 block, the hole is plugged with an aluminum piece, and the dipstick assembly is part of the oil filler tube. I was going to use the dipstick tube out of the original 83 engine after knocking the aluminum plug out of the 82, but upon careful inspection, it isn’t that simple. The machining in both holes is different. The 83 has a larger top part—the holes are step- drilled so that the bulge in the dipstick tube will seat at the step, assuring that the marks on the dipstick itself are the correct distance from the bottom of the pan and thereforeread accurately. The bulge in the dipstick tube on the 83 will not even fit into the 82 hole at all without grinding it down, which would thin the tube walls, making it weak and ruining for further use in an 83. Start with a 7.5 mm steel brake line 36 inches long, and while you’re buying it get a brass compression fitting that just barely fits over it. They make one that’s perfect, you just have to try a couple of sizes to find it. Push the fitting up from what will be the bottom of the tube so that the bottom of the ferrule is 30mm (7 and 5/8 inches) from the bottom. This has to be exact. Now mark the top and bottom position of the fitting and use a small file to clean the metal of the tube where it will sit. Now solder it in place. Slip a coil spring type pipe bender over the tube and bend it to shape by hand (I think I’ve already posted a picture of the proper bend photographed against a 1 inch grid for reference). The curve should be smooth, but it doesn’t have to be particularly faithful to the original for the setup to work. What DOES have to be accurate is the distance of the compression fitting from the bottom of the tube, and the length of the tube overall. Go to a junkyard and get any VW gas or diesel dipstick where the orange plastic piece snaps over the end of the tube. Unsnap it and throw away the tube, you are going to put the plastic piece on the end of the tube after bending the pipe, and cut the tube several times until the dipstick (dealer item if you don’t have one) protrudes from the end of the tube exactly two millimeters. Once done, drop this into the dipstick hole in your block and seal with black permatex. Behind the alternator, under the nut, drill and trim a hadware store angle bracket to fit under the nut. I bent the top, flat part of this to conform to the roundness of the tube and secured the tube to the bracket with a hose clamp. After putting 3.5 quarts of oil in the car, the dipstick shows the level exactly halfway between the marks. This entry was posted on August 19, 2010, 10:39 am and is filed under vanagon, vanagon mods. You can follow any responses to this entry through RSS 2.0. You can leave a response, or trackback from your own site.